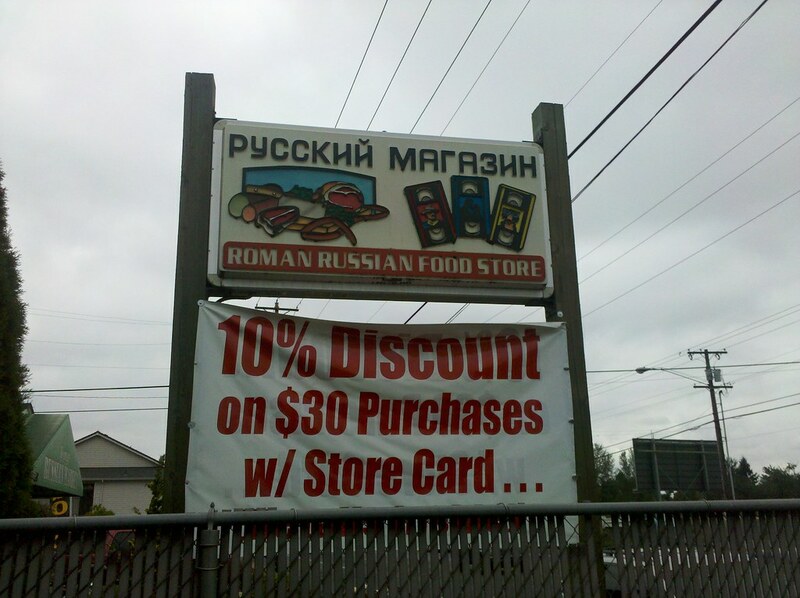 Roman Russian – I wonder what kind of food you would find there?? Ah but variety is the spice of a good long walk. I’ll bet Matt is enjoying this. Hi Jim! I just checked out your blog. I love that you wrote about Whidbey Island. I took a mini vacation there in a seaside cottage a couple years ago. It was amazingly beautiful! Also, nice reflection on what Lisa wrote! So true and heartwarming! I am not sure about the rest of this – but I understand there are Russians roaming (ROMAN) around this place. Hve your pepper spray and comode plunger handle ready. You may have to spary the animal to confuse it and then beat it to death with the handle. Then you can cook the meat with the pink feathers and enjoy with the Tavern RC and Tavern salted peanuts. What a treat. Looks northward and rolls eyes. Tennessee does things to a man. :-) You forgot the moonpied, though, Don. Chatttanooga will never forgive you for that. Maybe he should be walking up Hawthorne? I remember enjoying that street up by Mt. Tabor and the Mt. Tabor Cafe for Sunday Brunch and Pen and Ink. Anybody remember those places? LONG ago! How time flies! OOPS, I mean Bread and Ink. Just looked it up and it is still there..called Bread and Ink Cafe. Good place. White paper tablecloths, and you can doodle while waiting for food. And the correct name for Mt. Tabor Cafe is Tabor Hill Cafe! I’ve been gone for 16 years…I guess one remembers fun times but forgets details such as names! Matt should definitely go to one of the McMenamin Pubs! I guess he missed the one in Troutdale called Edgefield. But Portland has lots of McMenamin pubs scattered all around. We use to like to go to the one that showed movies in the old refurbished Mission Theater on NW Glisan. Anyway, Matt, try to get to one. Great beers and great Hamburgers plus other stuff. Like Reuben Sandwiches. Yum, yum. You can read about these famous brothers, their beer and buildings. I saw your message about the flooding andI was confused until I saw the news. This flooding is in the Nashville area again which is in the middle of the state. I am in the eastern part of the state next to the Great Smoky Mountains National Park. We had rain today (maybe a 1/2 inch) but not 12 inches like Nashville has had. Hope you are doing well! I am going to miss the dialogue with everyone! don..yea I see in Cookeville where the duriron plant is. that is where I spent a few weeks. Just was worried about you. I will miss y’all too…….but I know where to find you….Peace. Stay safe anyhow. Hey Don, do you live in or near Gatlinburg? Or do you live near Townsend or Pigeon Forge? We have been there many times. Just wondering since you said you were next to GSMNP. I live in Maryville and my house backs up to a farm. On a clear day I can see Mount LeConte in the Smokies. So to answer your question-yes I live within 45 minutes of Townsend and about an hour from Pigeon Forge and Gatlinburg. If yuou have never been to Cades Cove in the Park you need to go. It is an 11 mile loop road with old log homes, chruches, barns, a grist mill etc. You can drive it, bike it, walk it or even do day hikes from different parts. It is best to see it early in the morning to avoid crowds and try to avoid weekends if possible. We’ve been to Cades Cove many times. We used to make a family trip each year and stayed in Pigeon Forge. Our family have gotten so large (28 at last count) that we haven’t been able to find a place big enough. Sometimes we would caravan to Cades Cove. I have a beautiful picture of one of my granddaughters in one of the old cabins. We’ve been to Maryville and really know the whole area. Nice to know where you’re from since you are not too far from West Virginia. You need to come back. The 11 mile Cades Cove Loop Road was completely repaved this past spring for the first time since the mid 70’s. The road is so smooth! I have biked it and walked Cades Cove – beautiful! Go during the week (not on weekends, when it is bumper to bumper at times)! Well they probably had video rentals back when that sign first went up. It looks to be pretty old there don’tcha know. There probably are still VHS rentals. Russian stores like that are one of the few places to get older russian movies. Some are on DVD but most are still on vhs. Ahhhh..Thank you. At least one mystery is solved. Also, these stores usually provide the service where they convert VHS in PAL format to DVD’s ir NTSC format. This service was in high demand during the wave of immigration from Eastern Europe…. I’m glad to see that Matt’s taking his time through Portland. After such a long journey, he needs to slow down and really enjoy his last few days. And I think it’s wonderful that so many families have offered him a good place to sleep and relax 4 nights in a row! Ok, one question – how are we all going to keep in touch??? I certainly don’t want to lose the Hobo Friends on here. Well you could always email Jeff, you know Joisy Jeff who did the walking pool. He has some emails from some of us. And I think this site may stay up for a while. Jason Eppink who runs the site for Matt said it may be up for a year but no word yet on that for sure. But for now we indulge in this to the bittersweet end. And like I said, email Jeff from the walkin’ pool. You just might get some emails that way. I’m guessing there are a bunch of us who haven’t posted but have enjoyed your comments thoroughly. I know I’ll miss not only Matt’s journey but your thoughtful remarks! SLO – San Luis Obispo ?? There is also that facebook page – I don’t know who put it up, though – I guess they could take it down at any time. your blog is infectious. when I walk the kids to the park I notice things more. mailboxes, flowers, the details pop out more. really, all this walking and noticing is amazing! thanks for posting you pix, i will be sad when your journey is done. but thank you for the inspiration!! I totally agree, Mrs. Hall! Recently while driving I noticed the shadow of a hawk as it flew over the road and realized I’ve been looking for new and unusual things since seeing all Matt’s pics and reading the blog. Who knows how many times a hawk’s shadow has been right in front of me and I didn’t notice it – seems like a small thing, but then one of Matt’s purposes in walking was to notice the everyday things we take for granted, no? Hey Jennifer! Where in KY are you? My girls and I do a lot of our walking over in Devou Park and Main Strasse Village in Covington. The girls love photography and have gotten some great pictures during our walks. It’s funny because we’ve walked those places a hundred times yet every time, we see something new that we had never noticed. I agree with you and Mrs. Hall that Matt’s journey has really been inspiring. Julie, I’m in the northeastern part of the state in the triangle where Ohio, West Virginia and Kentucky converge. However, I may not be here too much longer. The hospital I worked for recently downsized and my position was eliminated, so more than likely I’ll have to relocate. For the past few weeks, Matt’s blog has been a lifeline for me – a place to escape for just a brief time the emotions of the situation. Keep enjoying those outings with your girls, and remember to look for the unexpected in the little things! LOL ! You’re to funny! I love it. I’d be the same way, “come down here and read it I’m not retyping it”. ha ha. Not a problem I found it. And thanks. I think we will all miss each other. It’s like visiting family everyday. We will all manage somehow to keep in touch. This could be the Hobo theme song, no? Always together. And you never know, this may be Rockaway Beach in a few days!! Great theme song John…I admit it gave me goosebumps! I believe there already is a facebook page no? Candice? katzien? Do either of you know? I thought it was one of you who posted about many weeks back. I don’t do facebook so I am not sure but if you do a search for it you’ll find it if it’s there. Ah thanks Gigi. I knew someone had. Sorry for not remembering exactly who. I did think it was someone here though that created it but my memory cells aren’t always turned on most days so I could be way wrong. You’re welcome Dorinda. I don’t know either who created the FB page but I’m happy somebody did. There is a facebook page, but I don’t know who set it up – Someone needs to set up a more permanent page. I’m assuming that one could “disappear” at the whim of whomever set it up. 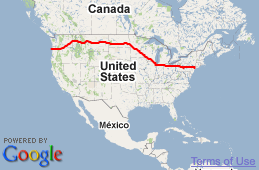 If Matt were to make it the coast in the next 3 days he will have walked across the united states in EXACTLY 5 months. Matt, was this store closed? Or just a bakery now? I did some reading about this place. Apparently they have a great store on another street called Foster. And in July of this year they closed down this one. Roman Russian has a good reputation. The Foster store is so clean you could eat off the floor and the Russian people very friendly. I think on my trip back to Portland over Thanksgiving, I will try to get to the Foster Store. Sounds interesting from the site I read. I’m enjoying this city “scenery” as well. As much as I like the outdoors, I still enjoy experiencing a bit of what Matt is experiencing. Is he walking down this street? Looks like it would take many, many days to truly STOP and ENJOY each establishment’s cuisine.